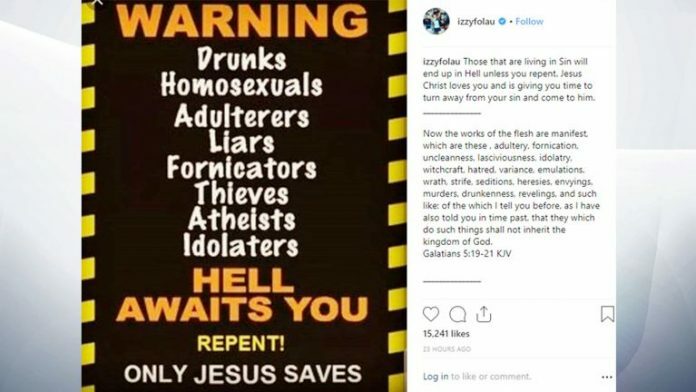 A date has been set for Australian rugby star Israel Folau’s code of conduct hearing over his homophobic Instagram post. The player will face a three-person panel on 4 May where he could be sacked after posting on social media that gay people were “going to hell”. Folau, 30, who was charged with a code of conduct breach, will plead his case to representatives from Rugby Australia, the Rugby Union Players’ Association and a lawyer. Rugby Australia and his club side New South Wales Waratahs have both said they intended to sack him over the post. In a statement, the governing body said: “Rugby Australia has today confirmed the Code of Conduct hearing for Wallabies and Waratahs back Israel Folau will commence on Saturday 4 May. Folau, a devout Christian, has been stood down from all rugby by the Waratahs, while several of his teammates have spoken out against his comments. Australia coach Michael Cheika has said he was unlikely to select him again, a setback for the team’s hopes of winning the Rugby World Cup in Japan later this year. England player Billy Vunipola, who liked Folau’s Instagram post, was booed by supporters for a second time and approached by a fan on the pitch while playing for his club side Saracens on Saturday. Vunipola, 26, refused to unlike the message and expressed sympathy for Folau’s views in his own social media post. He was warned about to his future conductby the Rugby Football Union. Justin Gleeson, the former solicitor-general of Australia, will be Rugby Australia’s lawyer at the hearing. An extra day has been allocated for the hearing if needed.